I feel so behind...OMG!!! We had an awful storm and almost every county around me and even in mine was Flooded over the roofs....We was spared thank God our House stayed dry and of course we Are all Safe!!! the down side is the fact that my telephone and internet went down on the 2nd I am finally on line and I have so much to show you that kept me sane while I was waiting to get my internet back....geez I have been so lonely and sad without you I didnt realize how addicted to the Cyber world I was but i hope I am never seperated from it again....ROFLMBO!!!!! I want to tell you that I am going to do something new for my kits....I mite not be able to do it for all of them but I will do xtra preview here on the blog with all or MOST of the poses available in the kits I make...I just have such a hard time with the previews because I LOVE all the poses so much and I thought that you mite enjoy seeing more of them.....All of my New kits can be picked up at TKO and I will be uploading to my other stores asap....I am going to be very busy but Gosh I LOVE you guys and it feels so good to be back......I also have been working with other demons in my life....lots of problems and other addictions and the sweet Lord has also helped me thru this....thanks so much for listening to my ramblings Please Talk to me....LOL!!! ask any questions you want to anything.....LOL!!!! Welcome back to scrapland. you have soooo been missed girl. 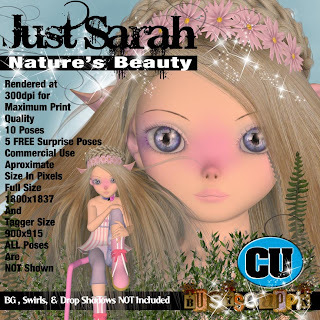 Just love your new poser's especially fairy dust. She's just so cute.